WHAT’S NOT IMPORTED WHEN YOU MOVE FROM QUICKBOOKS DESKTOP TO QUICKBOOKS ONLINE? Most of your QuickBooks Desktop company data comes with you when you move to QuickBooks Online, but there are some kinds of data we can’t bring over for you. Reconciliation reports Save your reconciliation reports in QuickBooks Desktop to access them later. 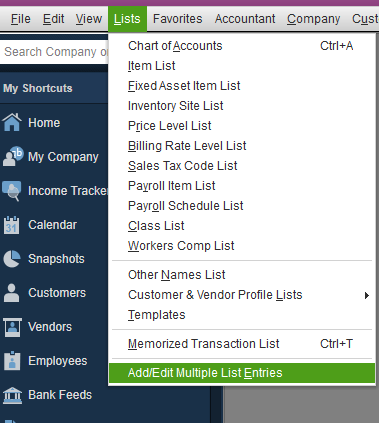 In QuickBooks online, just continue reconciling where you left off. See our Reconcile Your Accounts tutorial. Recurring credit card charges (all other recurring transactions will come over) Cancel each existing Automatic Credit Card recurring charge from your Merchant Center, and recreate it in QuickBooks Online as a recurring sales receipt. Reports Find a similar report in QuickBooks online and customize it to your preference. See the Customize Reports tutorial, or check out Apps.com (currently available only in English) for a list of reporting apps that can help your business. Audit trail Your desktop audit trail won’t come over, but all new changes going forward will be captured in the much improved audit log within QuickBooks Online. Inventory (from QuickBooks for Mac) Quickbooks for Mac isn’t capable of exporting inventory to Quickbooks Online. Instead you can save your company as a QuickBooks for Windows file and export it from a Windows machine running QuickBooks Desktop. Currently, we do not recommend QuickBooks Online to QuickBooks Desktop users who need these features. If you choose to use QuickBooks Online, you may be able to find an App that can integrate these features with QuickBooks Online. Check out Apps.com (currently available only in English) to see a full list. Not finding what you’re looking for? For a complete list, see our Import Limitations article. What data doesn’t come over from QuickBooks Desktop to QuickBooks Online? If you are migrating from QuickBooks Desktop 2015 or later, this guide can help you understand if the data’s simply not supported, or why it changed. If something isn’t listed below, it’s probably going to convert. If you do find something that isn’t being imported and isn’t on this list, please contact support for QuickBooks Online (US, Canada or UK). Open your browser’s “Find” function using Ctrl+F (Windows) or Cmd+F (Mac), or from your browser’s menu. Enter keywords related to your missing data type to see if they’re included in our list of import limitations (Examples of keywords include: reconcile, online bill payment, and estimate). If they are included, read the explanation to see if it answers your question. If they aren’t included, please use in-product feedback to let us know. The bank account number (if any) and notes (if any) are not converted. QuickBooks Online has an additional level of account typing, called the “detail type.” For example, expense accounts can have a number of detail types, such as Advertising, Supplies and Materials, Legal Fees, and so on. For accounts where the detail type is obvious (for example, Undeposited Funds), the conversion process assigns that detail type. For accounts where it isn’t clear what the detail type should be (the majority of accounts are like this), the conversion process assigns a generic detail type within the type, such as Other Miscellaneous Income which can be edited later. Run the Account Listing report (Reports > All Reports > Accountant Reports) post conversion to review the Detail Types assigned. Drilling into the report brings you to the edit account window where you can update the Detail type. The audit trail in QuickBooks Desktop is not converted to QuickBooks Online. QuickBooks Online has its own automatic Audit Log with a detailed audit trail of every transaction that is added or changed, and the log in/out of users accessing the file. Item receipts are converted to Bills. The Bill Received check box doesn’t convert. The discount applied to a bill in QuickBooks Desktop is converted as a Vendor/Supplier Credit. The address on the bill payment check/cheque is replaced by Vendor/Supplier address in Vendor/Supplier list. Note: Budgets are only available in QuickBooks Online Plus. Only Profit & Loss budget types convert to QuickBooks Online. Your QuickBooks Desktop closing date is converted. The password is not. After conversion the Exceptions to Closing Date report in QuickBooks Online will no longer show the exceptions that you had accumulated. Instead, new exceptions will be tracked in QuickBooks Online, beginning on the date that you convert your company file. Credit card charges are converted to Credit Card Credits. Bill payments made by credit card are converted to bill payments. QuickBooks Online currently doesn’t support custom fields on customers, vendors, employees, or items. In QuickBooks Online Essentials and Plus, you can add up to 3 custom fields on sales forms & transactions themselves. Note: “Sales Rep” converts to a custom field on sales forms. Your custom fields from QuickBooks Desktop will not be converted. All of your customers in QuickBooks Desktop are converted to QuickBooks Online. Your jobs are converted to “sub-customers.” However, not all of the customer detail and job information is converted. See the chart below for conversion details. *The Ship To Address converts, but not perfectly. The entire address will be placed in the main address field, leaving City, State/Province, Zip Code/Postal Code, and Country blank. Although a terms definition can specify the discount to be given in the event of early payment for Invoices, QuickBooks Online doesn’t automatically calculate discounts when payment is received. When converting your QuickBooks Desktop data, discounts already given to customers for early payment of invoices are converted as credit memos, applied to the customer’s outstanding balance. Discounts taken from vendors for early payment of bills are converted as vendor/Supplier credits, applied to the vendor’s outstanding balance. Any documents listed under the Company menu will not transfer over. We recommend saving these elsewhere so you’ll have access to them after you convert. Attachments on transactions are not converted. Your existing finance charge invoices are converted to invoices in QuickBooks Online with no data loss. QuickBooks Online currently doesn’t have an automatic way to assess finance charges for late customer payments. You can run a report to see which customers are overdue and manually add finance charges that will appear on the customers’ next invoices. To assess the finance charge after importing, create an invoice using the finance charge item. Based on the overdue report, manually enter the amount due for the late penalty charges as a line item on the invoice. If you have group items in your QuickBooks Desktop data file, they are converted to the products & services list. For your sales transactions your group items will convert as bundles. Each item of the group appears on a detail line when you view the transactions. Zero-amount lines are at the start and end of where the group item was so you can see which items were part of the group. The top line shows the group name, and the bottom line shows the group description. Group total will show on last line of invoice in Description field. If you have accounts, customers or vendors marked as inactive in your QuickBooks Desktop data file that have an open balance, they are converted to QuickBooks Online Plus as regular, “active” elements. If there is no balance tied to those names, they will convert as inactive (deleted). Note: Inventory is only available in QuickBooks Online Plus, and only using First-in-First-out (FIFO) method in accrual. Only QuickBooks Desktop for Windows can export inventory/stock to QuickBooks Online. When you select the option to import inventory/stock, it will ask you to choose a date, which we will use to recalculate your inventory/stock based on FIFO calculations. We will bring over your current item quantities, item accounts and details, and you will not need to do any work to your inventory/stock after importing. You are using the most up to date version of QuickBooks Desktop Pro/Premier 2015 and later or QuickBooks Desktop Enterprise 15.0 and later. 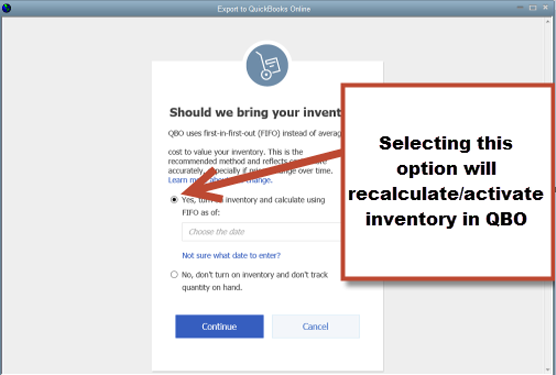 Inventory/Stock can’t be imported into QuickBooks Online if you are using the Enhanced Inventory Receiving feature of QuickBooks Desktop Enterprise. This feature can’t be turned off in QuickBooks Desktop (applies to US only). Inventory/Stock can’t be imported into QuickBooks Online from QuickBooks for Mac (applies to US only). 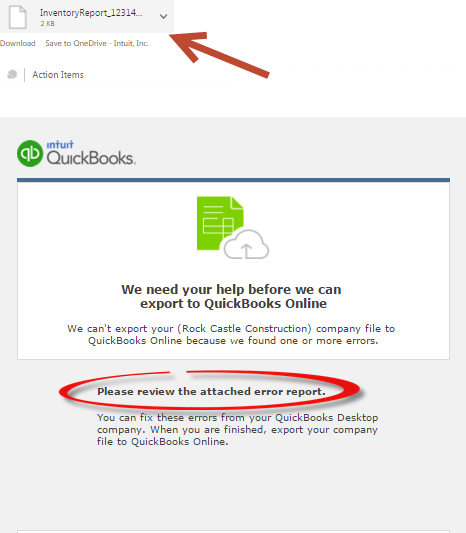 You received an email error message after importing with this subject line: There was a problem copying your company file to QuickBooks Online. You would only receive this email after attempting to recalculate transactions during the import process to the QuickBooks Online method of First-in-First-Out (FIFO). Here is a list of the issues that may require attention and how to resolve them. QuickBooks Online requires an item’s Income/COGs/Inventory Asset account to be of type Income/COGs/Inventory Asset or equivalent. Use the Error Report attached from the email you received to identify which items need to be edited. Changing the items so they are associated to the appropriate account types will make your reporting more accurate both in QuickBooks Desktop and QuickBooks Online. Flat Rate is not supported yet. This is an error with a sales tax rate as we do not yet support flat rates. You will also want to make sure you are retroactively updating the transactions as well when you save an edited item. Quantity required for tracked Inventory/Stock item. QBO needs to calculate your current Quantity on Hand so that your inventory/stock accounting will be accurate. This error will occur when you have a posted transaction with no value in the quantity field on a line item. The error report will show the date and transaction type (Invoice, Bill, etc.) that is causing the import to fail. Do an advanced search in QuickBooks Desktop (Ctrl + F > Select Advanced Search tab > Filter by date). Once you have the transaction open, look at the line items with inventory/stock parts on them. If you find a line with the “Quantity” field showing up blank, then you need to enter a 1 or value that will not change the rate and amount of the line item. Once you’ve updated the blank quantities on all the line items, save the transaction. Do this for as many errors as the emailed error report shows. After you have fixed all the line items, attempt the import to QuickBooks Online. Follow this process for all the different errors in the email you received, and then reattempt the import process. Sales Rep initials are translated to Custom Field. Subtotals do not calculate, but are included in the Description field for that line on the invoice. Progress Invoices (invoices based on estimates) and their extra fields are not converted, including: Est Qty, Est Rate, Est Amt, Prior Qty, Prior Avg Qty, Prior Avg Rate, Rate, Prior Amt, Prior %, Curr %, and Total %. The only piece of information that isn’t converted is a journal entry’s billable status; you can’t make a journal entry billable in QuickBooks Online. In rare instances, transactions (such as checks/cheques or invoices) in your QuickBooks Desktop data file are converted into general journal transactions. This translation occurs only if QuickBooks Online cannot recreate the original transaction. An example would be a check/cheque that uses an income account instead of a bank account as its source account. Custom sales templates aren’t converted but, if you are interested in creating a 100% custom template in QuickBooks Online, see How to Import Template Styles from Word for more details. QuickBooks Online allows you to memorize reports, but none of the reports you memorized in QuickBooks Desktop are converted. You will need to recreate the reports in QuickBooks Online and memorize them again. Canada: While you can’t transfer your existing QuickBooks Merchant Service account to QuickBooks Online, you can create a new one. UK: QuickBooks Merchant Services are currently not supported in QuickBooks Online. You can either e-invoice your customers with PayPal or GoCardless, or find a suitable app. Note: Multi-currency is only available in QuickBooks Online Plus. Multi currency will import into QuickBooks Online; however, there are certain ways that transactions can be created in QuickBooks Desktop that are not supported by QuickBooks Online. Transactions with 3 different currency types involved will not convert to QuickBooks Online at this time. Example: Let’s say your home currency is USD. If you create an invoice that bills a Canadian dollar customer, and have a line item on the invoice that is setup to calculate EUR (Euros), this transaction will not convert. You may have to create a new item/customer/account so that the transaction can be recreated in QuickBooks Online. You may also see penny rounding differences on transactions that are calculating multicurrency. Some currency types are unsupported, please reference the information below. QuickBooks Desktop offers the ability to create your own currencies. It also offers more currencies than are currently available in QuickBooks Online. You’ll need to change the unsupported currencies in your QuickBooks Desktop file to currencies that are currently supported in QuickBooks Online. For example: If you used Barbadian Dollar currency in your QuickBooks Desktop file, then you will need to change that currency in your QuickBooks Desktop file to a currency currently supported in QuickBooks Online (Costa Rican colón). After editing your QuickBooks Desktop information, import the file into QuickBooks Online. If the import is still not successful, you’ll receive another email indicating any other information that needs to be edited. Our Data Migration team can accommodate this limitation by changing the currency code to one that is supported for all affected transactions, names, and accounts in your file. We can guarantee this change will not affect reporting and will give you the option on what currency type is used. Please contact support if you are interested in assistance with this problem. Checks/Cheques marked “To be Sent” are converted, but their online bill payment status is not converted. QuickBooks Online now supports online bill payment allowing you to pay bills electronically through QuickBooks Online. To sign up for this feature, please Contact Us. QuickBooks Online currently doesn’t support online bill payment, however you can use an app to continue paying bills online. We have a few that we recommend, so head on over to our apps page for Canada or United Kingdom. From there you can use the search field and type “Bill Pay” (there’s dozens of apps to choose from). QuickBooks Online currently doesn’t have an Other Names list. All of the “other” names in your QuickBooks Desktop data file are converted to vendors/suppliers in QuickBooks Online. QuickBooks Online requires each user who has access to a company to provide a password when logging in. User names and passwords from Quickbooks Desktop do not convert. PAYROLL – HOW DOES IT CONVERT FROM DESKTOP? You’ll need to fill out an interview to complete setup after importing (company contributions, tax info, etc.) before you’ll be able to create paychecks. In most cases we will automatically import the current year’s worth of paycheck information as lump sums, but if it does not come over, you will need to enter past payroll totals (YTD Payroll information) for each employee. Paytypes that aren’t supported by Online payroll will not import. Employee addresses are about the only invalid information that we’ll bring over, but may require fixing after the fact. Addresses for states outside our supported states (such as, PR, AS, VI) will be dropped. You will need to enter past payroll totals (year-to-date payroll information) for each employee. Pay types will not import. Invalid Social Insurance numbers (SINs) & National Insurance numbers (NINs). Employee addresses outside the supported scope of QuickBooks Online will be dropped. Transactions and payroll accounts are converted in order to balance your books, but details behind the transactions (such as payroll item breakdown and employee year-to-date numbers) do not convert. Liability refunds, adjustment transactions, and opening balance transactions that affect accounts convert to journal entries. Employee payschedules convert as well as your items but you might have to manually map a few so we know how to calculate them if they are supported. See the custom pay item mapping section in What to do after completing an import to QuickBooks Online from QuickBooks Desktop Mac/Windows (US) for more information. QuickBooks Online currently doesn’t have a way to mark a sale as pending. No pending transactions from your QuickBooks Desktop data file are converted to QuickBooks Online. QuickBooks Online Essentials and Plus have the Delayed Charge form, which is a non-posting sales transaction. QuickBooks Online currently doesn’t have a way for you to automatically adjust prices of items (which are called “products and services” in QuickBooks Online). If you have price levels defined in your QuickBooks Desktop data file, they are not converted to QuickBooks Online. QuickBooks Online currently doesn’t print mailing labels. You can create a report of customer, vendor, or employee addresses, copy the report to Excel, and use the data to print mailing labels from Excel. QuickBooks Online currently doesn’t support progress invoicing. Note: Purchase orders are only available in QuickBooks Online Plus. Imported Purchase Orders that are closed will not be linked to their corresponding Bill. All the ways you can receive items in QuickBooks Desktop (Receive Item & Enter Bill, Receive Item, and Enter Bill for Received Items) are converted as bills. See bills and bill payments for details. Your past reconciliation reports are not converted to QuickBooks Online, however all reconciled transactions in register will have an “R” in the cleared column in register in QuickBooks Online. QuickBooks Online Plus and Essentials accounts support recurring templates. If you import into anything other than a Plus or Essentials account you will not be able to see your recurring transactions. However, the data is still imported and when you upgrade to a Plus or Essentials account, you should then see your recurring transactions. QuickBooks Online Simple/EasyStart doesn’t support recurring transaction templates. Delete all recurring transactions and templates from within QuickBooks Desktop before importing into QuickBooks Online Simple/EasyStart to avoid errors after importing. QuickBooks Online has “billable expenses,” which are similar to reimbursable expenses in QuickBooks Desktop. However, in QuickBooks Online, you specify the markup percentage when creating the purchase instead, when creating an invoice. Reimbursable expenses and time that have not yet been billed in QuickBooks Desktop will be converted as billable expenses in QuickBooks Online. Reminders do not convert to QuickBooks Online. QuickBooks Online doesn’t have all the reports that QuickBooks Desktop does, and some of the similar reports are slightly different. Although your Accrual Basis reports will match in both products, your Cash Basis reports may not match. This is because cash basis calculations are somewhat subjective, and there are several differences in how the two products calculate what is considered paid. In QuickBooks Online, your cash basis P&L report will show $100 of income and $ -100 of discount. In QuickBooks Desktop, no portion of an unpaid invoice shows in any cash basis P&L report. QuickBooks Desktop prorates the amount of the discount that shows in the P&L. QuickBooks Online continues to show the entire amount. Your accrual reports are unaffected by this change. 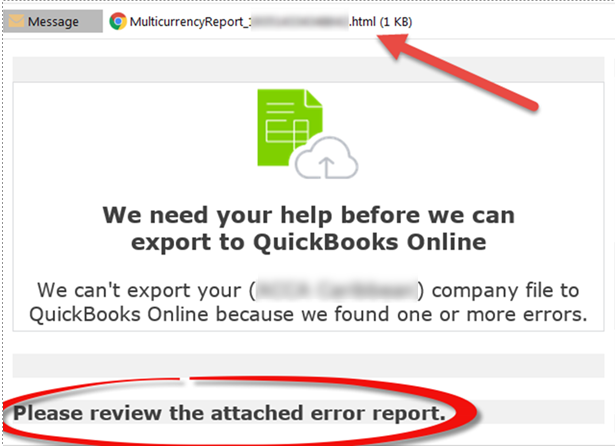 QuickBooks Online doesn’t have all the report customization options that QuickBooks Desktop does. QuickBooks Online does allow extensive filtering and supports exporting a report to Excel for further filtering if necessary. You can save your customizations (like memorizing a QuickBooks Desktop report) and schedule the report to be auto sent from QuickBooks Online. Any Sales rep names or initials you recorded in transactions in your QuickBooks Desktop file are maintained in the transactions in QuickBooks Online as a custom field. You can continue to assign sales rep information on sales transactions in QuickBooks Online and filter reports by sales rep as needed. However, when assigning sales reps to sales transactions, you’ll need to enter the name as opposed to selecting it from a predefined dropwdown list. One for each old Sales Tax Payable account from QuickBooks Desktop. One for each Sales Tax Agency Payable account in the new QuickBooks Online (set up automatically for each jurisdiction during the conversion). Moving forward, QuickBooks Online will only use the new Sales Tax Agency Payable account, and all sales tax will be managed from the Taxes (US), GST (CA), and VAT (UK) left hand navigation tab. Sales tax payments will convert as regular checks/cheques. Sales tax adjustments will convert as journal entries. Regarding VAT classes currently set up for Sales and Purchase tax (within QuickBooks Desktop), new codes will need to be manually created once the data migration is completed. Ship Via is converted, but when recording Ship Via information on transactions, you’ll need to enter the shipping method manually as opposed to selecting from a predefined list. Your shortcut list and icon bar settings from QuickBooks Desktop are not converted to QuickBooks Online. QuickBooks Online does have its own keystroke shortcuts, on any window, hold “Ctrl+Alt+?” (“Ctrl+Option+?” on Mac) to see the shortcut menu. QuickBooks Online currently doesn’t export information to TurboTax or other tax preparation programs. When a QuickBooks Online file is accessed via QuickBooks for Accountants, there is a Book to Tax feature, which integrates with Intuit Tax Online. QBO doesn’t support tax line mapping in the Chart of Accounts. QuickBooks Online has an additional level of account types called detail types. They may help you make tax line assignments to accounts when tax support is available. QuickBooks Online has a terms feature that is very similar to the terms feature in QuickBooks Desktop . 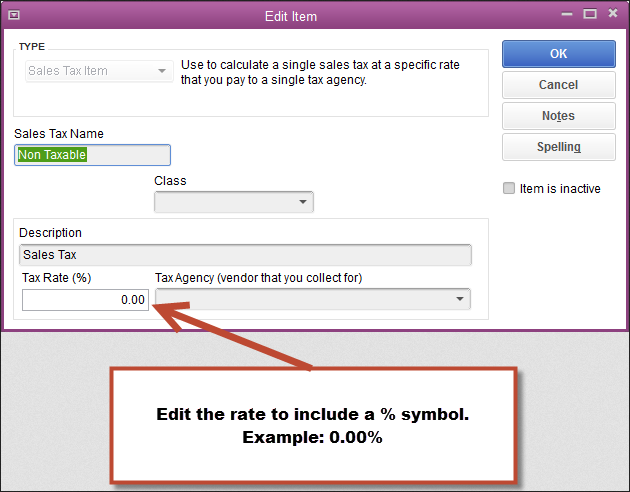 The terms automatically calculate the due date from the transaction date. However, QuickBooks Online doesn’t have an associated feature to assess finance charges associated with the terms you assign. Discounts for early payments can be specified in terms, but the discount amount isn’t automatically calculated. For example, if a customer pays early enough to qualify for a discount; you’ll need to edit the invoice yourself to add the discount. In QuickBooks Desktop, a job can’t have its own terms; it inherits its terms from its parent customer. In QuickBooks Online, the equivalent to a job (a “sub-customer”) can have terms, so you can edit the terms later to make them different from those of the parent customer. QuickBooks Online currently doesn’t have a way to categorize customers, vendors/suppliers, or jobs with types the way you can with QuickBooks Desktop. If you have types in your QuickBooks Desktop data file, the lists of types aren’t converted to QuickBooks Online. Also, when customers, vendors/suppliers, and jobs are converted, their type is not converted. Your QuickBooks Desktop To Do notes aren’t converted to QuickBooks Online. Currently, there is no way to define a task or to do in QuickBooks Online. Existing users do not automatically have access to QuickBooks Online, instead they will need to be re-invited from QuickBooks Online to gain access. QuickBooks Online has access permissions that limit the user’s ability to see and use different parts of the application but they don’t allow you to control access at the level of transactions like QuickBooks Desktop could. All the vendors/suppliers in your QuickBooks Desktop data file are converted to QuickBooks Online but not all of their detail/information converts. QuickBooks Online currently doesn’t have an automated way to use your data to generate customized letters.